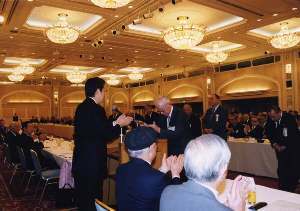 On November 25, 2002, a meeting of the board of directors and councilors of Chado Urasenke Tankokai Inc., followed by the organization's regular national general meeting for autumn, was held at the Kyoto Hotel Okura. 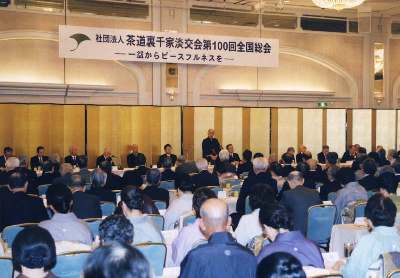 It was the organization's memorable 100th general meeting since it became a legally incorporated body in 1953. The board meeting commenced at 12:30. There were twenty-eight directors and supervisors, and seventy-eight councilors, assistant councilors, and special councilors in attendance. Firstly, a minute of silent prayer was observed for Prince Takamado (youngest brother of Mme. SEN Masako), who unexpectedly passed away on November 21. Zabosai SEN Soshi chaired the meeting, and the various bill proposals put before the board all received unanimous approval. Vice-chairman NAYA Yoshiharu reported on matters related specifically to the Urasenke head house, after which the two recently appointed Konnichian elders (rôbun), IKAWA Takao (Chief Executive, Oji Paper Co., Ltd.; Tankokai board member; President, Tankokai Mishima Chapter) and HONJO Hachiro (President, Ito En Ltd.; Tankokai board member; President, Tankokai Tokyo West No. 3 Chapter; Professor, Tianjin University of Commerce Urasenke Junior College of the Way of Tea), each presented a few words. Then Tankokai Executive Director SEKINE Hideji reported about matters related to the Tankokai general headquarters. The general meeting, at which the presidents and executive managers of the nation's 165 chapters and 2 sub-chapters convened, commenced at 2:00. 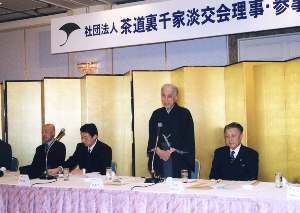 Grand Master SEN Soshitsu XV, in his opening address, explained about his decision to turn over the position of grand master (iemoto) to Zabosai. Following this, Zabosai gave an address, stating that his becoming grand master from January 1 next year would be an extension of his forty-six years of life to that point, and that, as grand master, he intends to endeavor every day in his training and never be negligent. Then he announced his 2003-2004 guidelines for the organization. 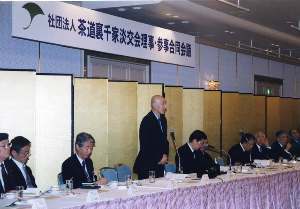 SEN Soshitsu XV addresses the councilors and board members. Zabosai SEN Soshi speaks at the general meeting. 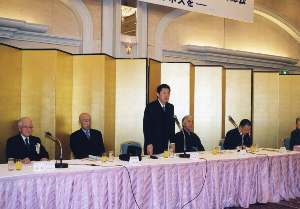 In conjunction with these changes, which were effective immediately, Grand Master SEN Soshitsu XV, who was honorary president, took a seat as a member of the board. In commemoration of the 100th general meeting, awards were presented to chapters and individual officers with a history of good attendance at the twice-a-year national general meetings. IZUMI Soko Masakazu speaks at the board meeting. Zabosai SEN Soshi presents awards.